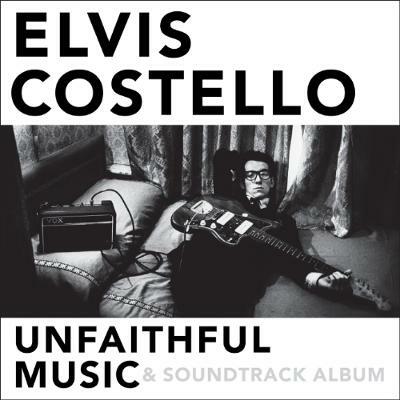 Artwork for Elvis Costello "Unfaithful Music & Soundtrack Album"
The iconic British singer-songwriter and producer who came to prominence as part of the 1970s New Wave is releasing a double album of songs to accompany his forthcoming book. Costello's eagerly awaited memoir "Unfaithful Music & Disappearing Ink", which will hit bookshops on October 13, looks back on the themes, stories and incidents that have shaped his life in front of and away from the microphone. But in addition, and adding a new twist on the celebrity autobiography/memoir genre, the book is being put to music. "Unfaithful Music & Soundtrack Album" contains 38 tracks that the artist claims offer the deepest emotional connection to the themes and stories in the book. And, like his traditional album output, this release will contain alternative takes, demos and two previously unreleased songs: "April 5th," written and recorded with Rosanne Cash, Kris Kristofferson and John Leventhal, and "I Can't Turn It Off," a solo recording from 1975. What's more there are three audio book chapters on the double album containing material that isn't in the printed counterpart.